We’d love your help. 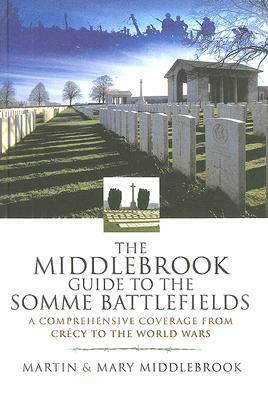 Let us know what’s wrong with this preview of The Middlebrook Guide to the Somme Battlefields by Martin Middlebrook. To ask other readers questions about The Middlebrook Guide to the Somme Battlefields, please sign up. A visitor to the Somme cannot but be moved by the number of cemeteries and the number of graves - the sheer scale of the human cost of the battles fought here in WW1. This guide provides an overview of the 1916 and 1918 battles (with passing comments on other battles in 1346, 1870 and 1940). It is particularly noteworthy for its comprehensive detail on Commonwealth military cemeteries, with personal insights on those buried in many of them. For those with an interest in military history, this bo A visitor to the Somme cannot but be moved by the number of cemeteries and the number of graves - the sheer scale of the human cost of the battles fought here in WW1. This guide provides an overview of the 1916 and 1918 battles (with passing comments on other battles in 1346, 1870 and 1940). It is particularly noteworthy for its comprehensive detail on Commonwealth military cemeteries, with personal insights on those buried in many of them. A beautiful travel guide written by an historian with a meticulous approach to detail. Martin Middlebrook (born 1932) is a British military historian and Fellow of the Royal Historical Society. Appointed Knight of the Order of the Belgian Crown in 2004.